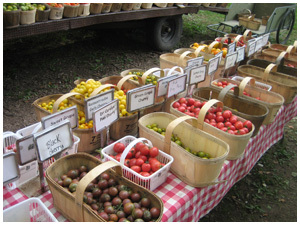 One of the best events of the year in Prince Edward County is Vicki’s Veggies Annual Heirloom Tomato Festival. Held every year on Labour Day weekend, the open house offers over 100 different varieties of heirloom tomatoes to sample and buy…along with other great gifts from the garden. There’s sausages, corn and pie too! Ye-haw! Vicki’s Veggies is a small family-run farm located in the deep south of Prince Edward County, on Morrison Point Road near Black River Cheese. It’s owned and operated by Vicki Emlaw and Tim Noxon.